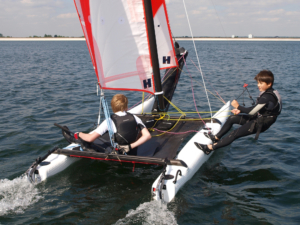 The TOPAZ 12 is the smallest catamaran in the Topper range and is aimed at introducing youngsters to catamaran sailing at as early an age as possible. The 12 is simple to sail and lightweight enough to be operated by one child although it is primarily designed for two crew, a child and an instructor or two children sailing together. Everything is geared towards a user friendly sailing experience including quick and easy rigging. The Topaz cats are all roto-moulded in tri-laminated Metalicene™polyethylene producing the stiffest, lightest and most dynamic hulls available. The hulls are also extremely robust and low maintenance making them ideal for even the toughest sailing school environments. High foredeck with lots of volume in the bow area is great for stability, handling and taut feedback. The built-in skeg design hulls (so no need for daggerboards) make for simple user friendly sailing. No boom makes for one less thing to worry about. Lock-in beams provide a rigid sailing platform and stiff hull performance. Adjustable, safe and simple “Race” Rudder System allows you to adjust the rake of blade dependent on conditions. Fully battened mainsail provides exciting performance. Durable and manageable Dacron radial cut mainsail and cross cut jib. Single-line “Race” Gennaker System is easy and effortless. Snuffer tube and gennaker sock. High quality foot straps for trapezing. Unique non-slip pattern is user friendly and provides extra grip when trapezing. Foam filled sealed mast for extra safety. Step hinged mast makes rigging quick and easy (even for one young person). Incredibly high quality hardware including ball bearing blocks and race specification cleats. Hard wearing injection moulded polyethylene rudder blade. Total rigged weight of just 85kg.